There are times I fire up the laptop and open up WordPress but stares at it for hours without knowing what to write. Similarly, there are days, though not often, I’d stare at my pantry not knowing what to cook. I’m blaming the weather (the weather gets a lot of blaming from me I must say). Sometimes I resort to super simple dishes that doesn’t require too much of work but yet still a pleasure to eat. And in this climate, a cold noodles dish can be very refreshing. I always have various types of noodles stacked away in my pantry. None of the instant ones as it’s just as easy whipping up a Rice Vermicelli or Kueh Tiaw soup without all the artificial ingredients. Maybe one day I’ll do a compilation of my ‘instant’ noodle dishes. Anyway, the newest addition to my pantry is a packet of Cha Soba. Made of buckwheat and green tea, it’s often eaten simply cold with a dipping sauce. I love the idea of putting green tea in pretty much everything. Besides the delicate taste, bonus antioxidant is always good. I’ve stuck to the original recipe and made a Cold Soba this time. Cook noodles in boiling water for 4 minutes or until al dente, drain and rinse under cold water, then drain well. For dipping sauce, combine all ingredients in a small pot and bring to boil. Transfer to a small bowl. 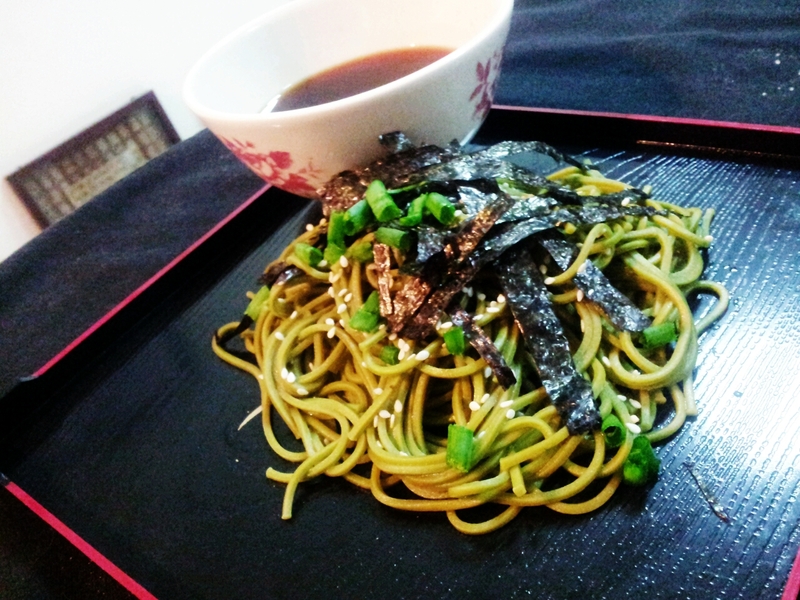 To serve, pile noodles neatly on the plate, scatter with sesame seeds and nori strips. Place the bowl of dipping sauce on the side with wasabi paste if using. The traditional way of eating this is to hold the bowl of dipping sauce, use the chopsticks to grab a bundle of noodles, swirl around in the sauce and slurp. Some people prefer to just toss the noodles with the sauce, but I think the former is definitely more fun! Oh, and on a totally unrelated note, I’m performing at The Scot’s at Jaya One every Friday and Saturday night this month so if you have are free do drop in! Happy Weekend! Yeah gotta have the dashi for the umami factor. Using Lemon is interesting though, I think I’ll try that! 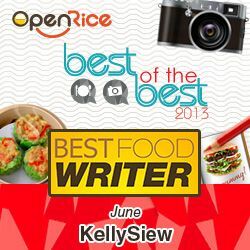 Oh Kelly, I love eating noodles of any kind, have never tried soba though, even I’ve heard about it a lot. You’ve just inspired me to give this a try! I’m gonna make cha soba tomorrow.. just got myself a bottle of soba dipping sauce. Nice! Saves the time from making the sauce then. Niceeee and easy recipe 🙂 thanks! I haven’t had soba for sucha long time! Superbly written. Great images too.